HARROWING footage shows the moment construction workers frantically searched for a screaming 18-year-old apprentice buried under collapsed scaffolding in Sydney yesterday. A cacophony of anguished yells can be heard in the clip that shows dozens of tradies watching on in shock next to a massive pile of collapsed metal at Epping Road in Macquarie Park yesterday. The teenager, who died after a 17-metre tall scaffolding structure collapsed on top him at a building site, has been remembered by friends as an "angel" who always looked after everyone. Christopher Cassaniti had turned 18 just days ago and was an apprentice form worker. He and another man, who is 39-years-old, became trapped beneath a mountain of twisted steel and cement bricks after the horror accident at a development project just after 12.20pm yesterday. Tragically, his mother could be seen breaking down at the construction site where she had also worked regularly - serving her son and his workmates from her coffee van. More than a dozen emergency crews rushed to the "nbh" at Lachlan's Line construction site - a mixed-use residential and commercial development project - and managed to free the older man after an hour. He remains in a critical condition, Sydney's Royal North Shore Hospital has said. Rescue workers continued a "delicate" operation to free Christopher but struggled to reach him due to the sheer amount of debris. He was pronounced dead at the scene. CFMEU Construction & General National Secretary. This morning, CFMEU Construction & General National Secretary Dave Noonan, said the death was caused by a "catastrophic failure of a scaffolding". "Scaffolds are working platforms for workers to work safely off," he told the Today show this morning. "If they are erected safely, maintained properly and loaded properly and within their capacity, then they do within their capacity, then they do not collapse." Mr Cassaniti's family friend Damion King, 16, said they had only just been celebrating Christopher's 18th birthday on the weekend. "My dad called my sister first and she called my mum and she just started crying," Mr King told news.com.au. "That's when I found out and 30 minutes later his brother posted RIP Chris. It's really sad. "We used to go on holidays together. He always looked after everyone, he was very kind. "He just bought a car and was just starting his life. It's so sad to see him lose everything." On Facebook, family friend Bella Mineo said she would "always love" her friend Christopher. "Today I am crying because I have lost a person who occupied a very special place in my heart," she said. "You have been my friend since the first day of kindergarten. Words can't express how much this hurts. You were full of positivity, always smiling, always seeing the best in everyone. You are an angel. It hurts me that someone so precious had to pass. Forever in my heart." Darren Greenfield, state secretary of the construction industry union CFMEU, said Christopher's distraught parents arrived just before police confirmed the tragic news of his death. 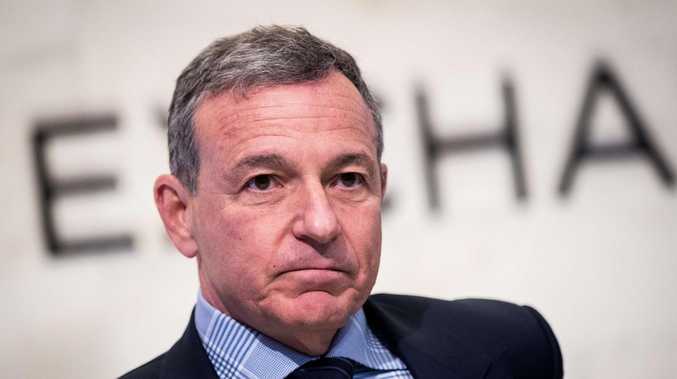 "As you'd expect, they're devastated to lose their 18-year-old son," Mr Greenfield told news.com.au. "He's new to this industry, early in his working life. To lose his life doing a job is atrocious." It's understood the man's mother worked in a food truck that visited the site daily. Mr Greenfield said he understood the men, believed to be form workers, were on the ground when the structure collapsed on top of them. "The scaffold has come down from about 15 (to) 17 metres," he said. "Some bricklayers working up there, they jumped back onto the balcony otherwise they wouldn't be here now. "Unfortunately these workers were working on the ground, as far as I'm aware, and it's come down on top of them. You can imagine, 17 metres high, four layers of scaffolding, that's a lot of steel coming down." 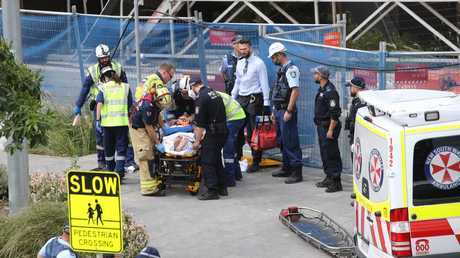 A worker who rushed to help the men after the collapse told news.com.au that he was "shattered and heartbroken". "We got to them and nearly had them but we all got rushed, told to jump off," the man said. "There was nothing else we could do. We could hear them calling for help. We tried our hardest to get the scaffolding and bricks off them and we managed to reach them but were told to back off once the fireys and stuff came. "He was a good young man. Just eager to do his work. He always had a smile on his face, just a bright young man. I'm speechless." Mr Greenfield said the workers, many of whom remained gathered at the site well into the afternoon, were in a state of shock. "I've seen probably 14, 15 deaths in the construction industry so I know what they've seen and I know by the looks on their faces and what they're saying …"
Worker Albert Muscat told Channel 9 he could hear the men screaming for help after the collapse. "We started cutting with the grinders and hammers until about 20 minutes later we couldn't hear screaming anymore, that's when the supervisors told us to move out," he said. It's believed the scaffolding was in the process of being removed as the project nears its completion. The man who was freed at about 1.30pm was rushed by ambulance to Royal North Shore Hospital in a critical condition with pelvic and abdominal injuries. Steve Vaughan, acting superintendent of NSW Ambulance, said it was an "absolutely chaotic and emotionally charged scene" when paramedics arrived. "It took some time to ascertain what had happened," Mr Vaughan said. "They were able to treat and stabilise one of those patients who has since been transported to (hospital) in a critical condition." A witness who was eating lunch next to the site when the collapse occurred told 10 News it was a "scene of panic". Firefighters deployed seven crews, including a team that specialises in structural collapses. Three teams of paramedics and a Care Flight Rescue Helicopter were also called to the scene, along with a number of police units. In a statement, construction company Ganellen said it had promptly worked to assist emergency workers at the site of the $220 million development. "Our immediate concern and focus is on the safety of our people and according for those who were in the vicinity of the accident, and ensuring the site is safely secured," the builder said in a statement.